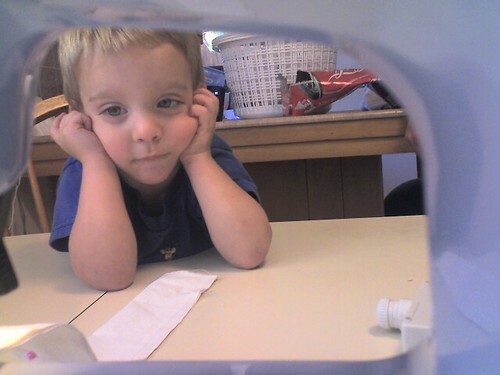 The View Thru My Sewing Machine…, originally uploaded by domesticchicky. AW! That is such a cute picture!! Cute babe! That is darn cute!! Don’t leave your house, I need to call you today! That picture is *awesome* – beyond its cute factor….it is a real slice of life. Imagine what it looks like from his end…. He looks captivated by what mama’s doing…. Such a cutie! How precious! What a little cutie pie! Too cute!! I could eat that face up! That is a fantastic picture. You need to frame that one and hang it in your crafty room! That is worthy of a frame!!! I’ve seen that look so many times! LOL! are you almost done? are you gonna cook for me now? How much longer til we go to the park? LOLOLOL!